Illustrated below with each miniature is an image of the same building found on the internet. When possible, I selected images portraying the building as identical as possible to the image on the miniatures. All photos and postcards are linked to the websites where the images were found. Many of them have excellent additional information on the topics discussed, in English or in Russian. Miniature 1. Engraved in Russian: Elisabeth Inst. 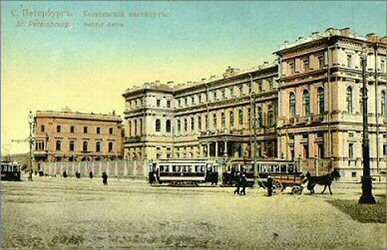 in SPB founded in the year 1808. The engraving is on the back of the second miniature since the first miniature itself is not engraved, because the first and last gold ovals form the front and back of the closed Egg. The building as depicted on the miniature no longer exists. Miniature 2. Engraved in Russian: St. Petersburg Orphanage Nikolaevski Inst. founded in 1837. 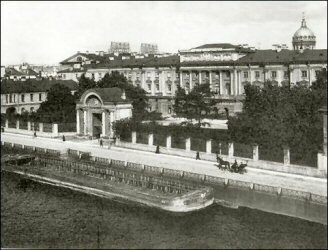 In 1834 Tsar Nicholas I ordered the construction of the St. Petersburg Orphanage (a branch of the Moscow Orphanage) on the Moika river embankment in the former palace of Count K.G. Razumovsky. 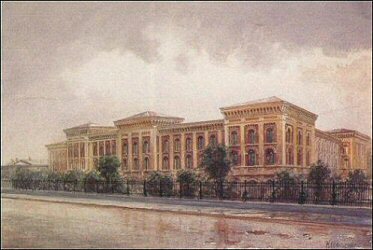 The building opened in 1837, and in 1856 after the death of Nicholas I (1796-1855) the institute was given the name Nicholas. 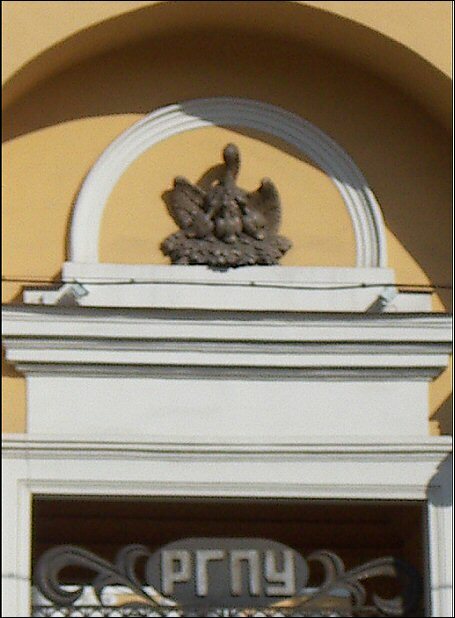 Today the building is used by the Herzen State Pedagogical University of Russia (РГПУ), one of the largest universities in Russia, which operates 20 faculties and more than 100 departments.3 For a recent photo of the university entrance building with its historical emblem the Pelican Feeding its Young click here. Miniature 3. Engraved in Russian: Catherine Institute founded in 1798. Miniature 4. Engraved in Russian: Pavlovski Institute founded in 1798. The Pavlovski Institute was built in 1798 by decree of Paul I as a military orphanage for children of officers and soldiers who died in battle. The focus was on the education of boys, and a division for girls was only supplementary. When Alexander I came to power, he ordered separate wards. In September 1806, a girl's division was opened and renamed Pavlovski Women's Institute in 1829. 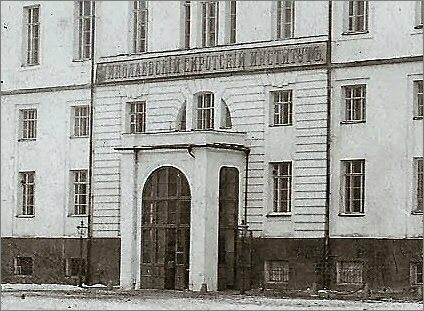 The military orphanage at the same time was renamed Pavlovski Cadet Corps. 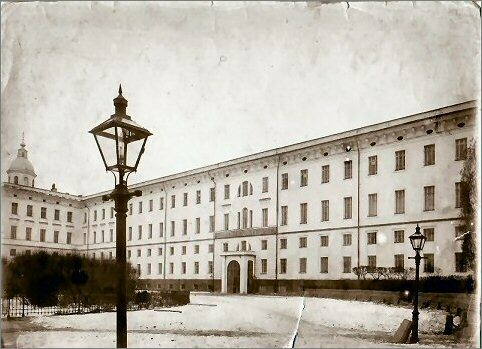 In 1829, the College was taken into The Office of Institutions of Empress Maria, received a new status and became known as Pavlovski Institute for "noble" (the daughters of nobility, staff and senior officers) and "soldiers" (the daughters of the lower ranks and non-commissioned officers). The students lived in separate quarters, ate in different dining rooms, walked separately, and attended church at different times. The building depicted on the miniature was built in the 1840's. Miniature 5. Engraved in Russian: Smolny Institute founded in 1764. 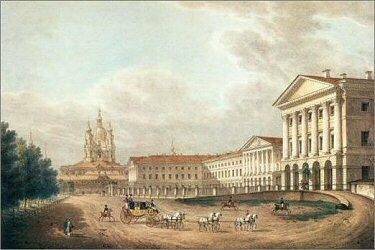 The Smolny Institute is the large building on the right of the image. In the back is the church of the Smolny Convent. Empress Elizabeth I (1709-1762), daughter of Peter the Great, ordered her favourite court architect, Bartolomeo Rastrelli, to build a convent where she wished to spend the rest of her days. 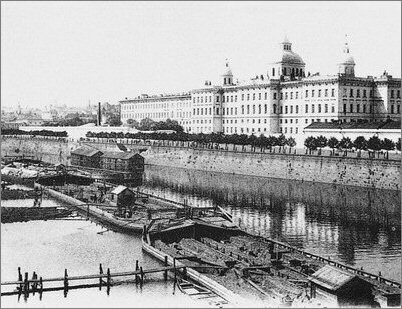 By old Russian tradition, churches and cathedrals had to be erected on a riverbank, so Rastrelli chose to place the convent in a bend of the Neva River previously allotted for the Smolnoi dvor (the tar-yard for the needs of the Admiralty). The convent’s official name was the Resurrection Novodevichy Convent, but it was known as the Smolny Convent among the citizens, since “tar” is “smola” in Russian. The construction of the Convent began in 1748 and continued for a fairly long time. Empress Elizabeth did not live to see it completed. 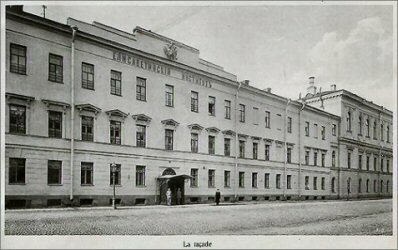 In October 1917, Vladimir Lenin and the Bolsheviks appropriated the Smolny Institute and made it their headquarters until March 1918. 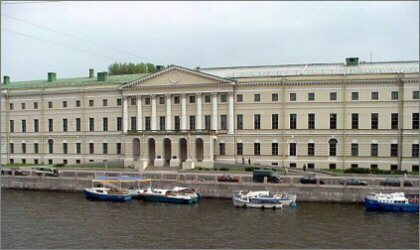 Since then, the Smolny campus has continued to be used for governmental purposes, eventually becoming home to the St. Petersburg Duma. Several rooms have been preserved as a museum honoring the Institute's past. Miniature 6. Engraved in Russian: Patriotic Institute founded in 1827. In the 18th century a wooden landhouse on Vasilevsky Island was purchased for the Women's Patriotic Society. In this building in 1812, a school was established for girls (daughters of officers), whose fathers were killed during the war. In 1827, the school received the status of institute and in 1828 was rebuilt with two side wings. In the years 1831-1834, the Russian writer Nikolai Gogol, who is considered the father of modern Russian realism, worked here as a teacher of history. After the 1917 Revolution the buildings of the Patriotic Institute were handed over to the Women's Polytechnic Institute, later named the Second Polytechnic. The building today houses the Energy College (Power Engineering College) of the State University - Higher School of Economics. Miniature 7. Engraved in Russian: Xenia Institute founded in 1895. The Xenia Institute was situated in the Nicholas Palace, the palace of Grand Duke Nikolai Nikolaevich the elder (1831-1891), son of Emperor Nicholas I and brother of Tsar Alexander II. When the Grand Duke died, his wife took the veil and the palace passed into the Treasury. 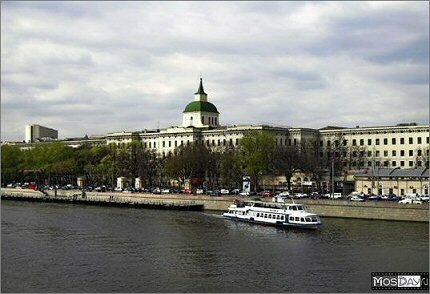 In 1918 the building was was transferred to the Petrograd Council of Trade Unions and renamed the Palace of Labor. Currently the building is used by the Council of Trade Unions of St. Petersburg city and the region. It is also used for commercial purposes. Miniature 8. Engraved in Russian: Moscow Orphanage Nichalaevski Institute founded in 1837. 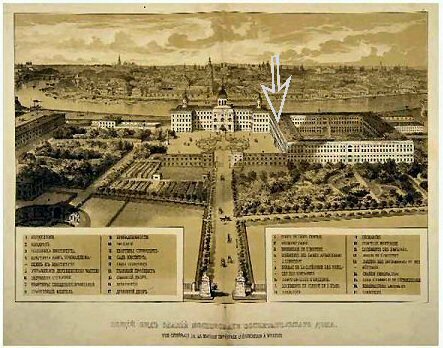 I found quite a few references on the internet to a Nicholas Institute in connection with The Moscow Orphanage, which is a quite famous and a huge building not resembling the watercolor in miniature 8. My question, was the building perhaps a branch in St. Petersburg that no longer existed? My virtual journey took me through many, many webpages on the internet. Tired and exhausted and almost convinced this was a mission impossible, I landed on a web page about orphanages and old photographs. I jumped up with joy, I had counted so many windows and floors in as many buildings to find my building and this one fitted, this was it! Sign above the Entrance Identifies "Nikolaevski Orphans Institute"
Now it was easy, the blog8 told me the building was located in Moscow along the Moskva River. 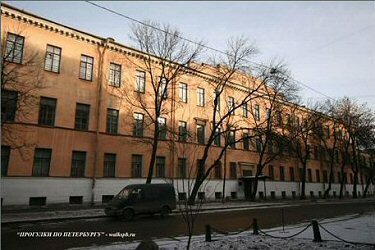 Comparing old photos of the Moscow Orphanage to the blog photos convinced me that it was one and the same building. The dome-shaped towers (demolished after 1917) of the Moscow Orphanage matched the old photos on the blog. The "missing building" was finally found and now its story can be told too. In 1812 Moscow was hit by a great fire and although the Moscow Orphanage was saved thanks to local police, half of the city and almost half of all the schools were destroyed. They were restored and in the 1830's and 40's new schools opened. In 1837 the Nicholas Orphanage was opened in the Orphanage building, in the western wing. Moscow Orphanage. Lithograph 19th Century. Arrow Identifies Nicholas Institute in the Western Square. The Bolsheviks disbanded the Orphanage immediately after the Revolution. 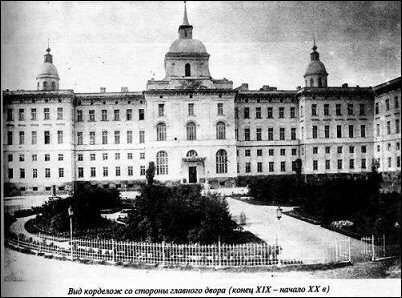 The main building was conveyed to the Soviet trade unions, followed by a Military Academy and a long succession of state institutions. During Stalin's reconstruction of old Moscow (1937), several Orphanage buildings were torn down to make way for a new bridge. The right wing of the Orphanage was topped out by June 1941, but the project was not completed until after World War II. Viewed from the outside, this later addition is only marginally different from the left wing, to which the top floor was added at about the same time. The main building now conforms quite closely to the original designs of architect Karl Blank. The building depicted on the eighth miniature was the most difficult to find - yet it is the most important of the Pelican Egg miniatures. Based on my research, the emblem of the Moscow Orphanage (which housed the Nicholas Institute) was Fabergé's historic inspiration for the creation of the Pelican Egg presented as a commemorative gift in the year 1898. That story starts here: Historic Connections. Blog has many more images of the interior of the institute. Webpages last visited and information retrieved: March 15, 2010.